I’ve been making good progress on our camping quilts recently. The rainbow one is quilted and next in line to be bound. Another one — made from pink log cabin blocks and sashed in brown — is at the quilter now and should be back in my hands next week. Theoretically, the rainbow quilt is for Papa and I and the pink/brown one is for Katie. That just leaves Tristan without a camping quilt. I have this great train ticket fabric that we used as a tablecloth for Tristan’s second birthday — look how little he is! — that I want to use as a back. I’m planning on using brown and black/grey log cabins for the front but here’s the problem. My stash is not burgeoning with brown and black/grey fabrics. Is yours? So, I’m looking for scraps. The smallest size I can use is 2″x3″. I have many scraps of other colors I can share, even selvedges for those who collect them. Anybody up for a trade? A little update on the knitting. Amanda Jean‘s socks are done. Thank goodness. I have never really suffered from second-sock-syndrome — the inability to finish the second sock — but I am definitely at the top of the third-sock-syndrome list. No, Amanda Jean does not have three feet it’s just the first sock I knit was more suitable for someone with very wide feet. Very. Wide. Feet. 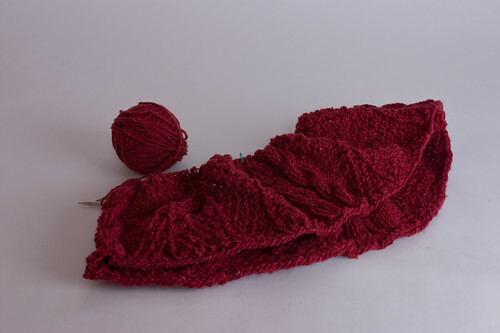 Not so well suited for Amanda Jean so I unknit the giant sock into a more human sized one. And now two Amanda Jean sized socks are in the mail. Phew. 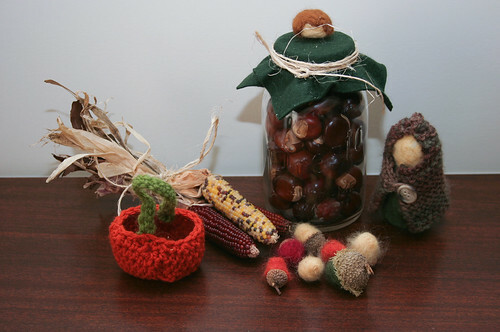 I mentioned before that I”m trying to knit through Elizabeth Zimmermann’s A Knitter’s Almanac this year. I’ve made good progress on my January sweater. That thing is very cabled so it takes some concentration and can start to make my hands tired so I can’t knit it for too long or for too many nights in a row. I’d like it to be ready for wearing next Autumn when the weather turns cold again. In the meantime, February rolled right in — how did that happen so fast? 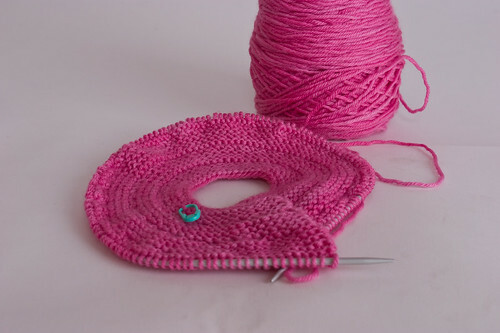 — and I started the February baby sweater. I considered making the lady’s version of the sweater but decided instead to stick to the patterns really included in the book. Plus, I can only have so many adult-sized sweaters on the needles at once. Now I just need someone I know to have a baby girl, it seems there’s been a run on boys around here. I realized over the weekend that I have a number of things I haven’t shared with you guys that I’ve been meaning to share — don’t get too excited, nothing major — so I think I’ll be doing some catching up this week on the blog before we start careening toward the holidays. 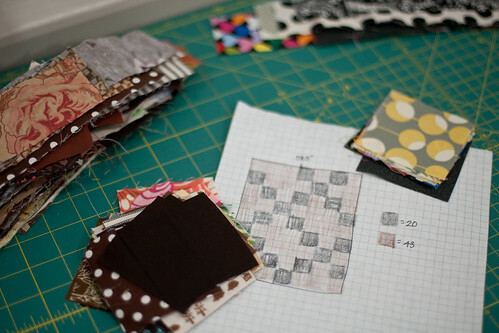 First up, the Virtual Quilting Bee. The last block I showed you was from July. Well, we skipped August because Eren‘s fabric got lost in the mail but I finished up my September and October blocks yesterday. Melissa wanted trees. I really liked the trunk on the tree in Erin‘s block and wanted to incorporate that idea into my block. I originally though I might use yo-yos to make the tree tops but decided that would be a pain in the neck for Melissa and me both. Then I remembered this skirt that Melissa made a little while ago. Perfect. The fabric behind the white is not knit, as is typical in the Alabama Stitch style and the stitching around the leaves was done on the machine but it is definitely inspired by that style. The little bird was appliquéd on at the end. Morgan was looking for something block-y and a little bit crazy using Aunt Grace‘s style prints. She asked for the white block in the center too. I’m not sure I love this but I think combined with the other blocks it will make the quilt Morgan is looking for so I’m not changing it unless Morgan decides she doesn’t like it. It’s a great thing about the VQB, you have to create outside your personal style and that is a fun challenge. And speaking of the fun of the VQB I get asked lots of questions about how the whole thing works and would I mind if you started your own Bee. 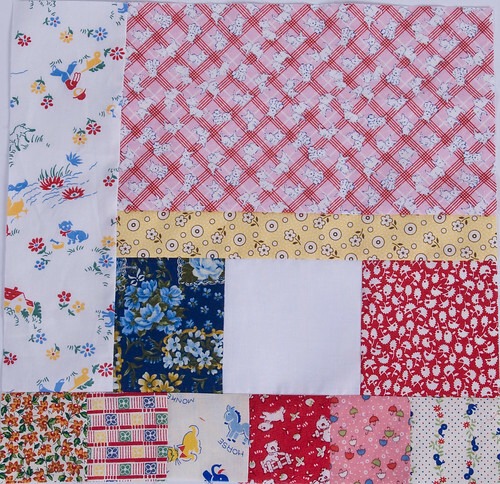 I was certainly not the first person to think of a quilting bee in cyberspace so there is no need to get my permission. I love to see all the other bees popping up. I wish I could organize a whole bunch of them but believe me, one keeps me busy enough! Anyway, I’ve added an FAQ section to my VQB page with some info about how we operate. I hope that helps all of you with questions. 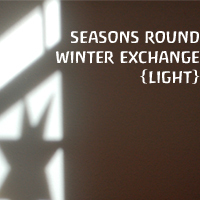 Thanks for indulging me with Autumn Is… I have a few more posts to get to before we start heading into Winter. Now though, let’s talk yarn and sticks. The temps here took quite a dip at the end of last week and it is feeling very brisk around here. This morning we even had a real frost. Time to start thinking in wool. 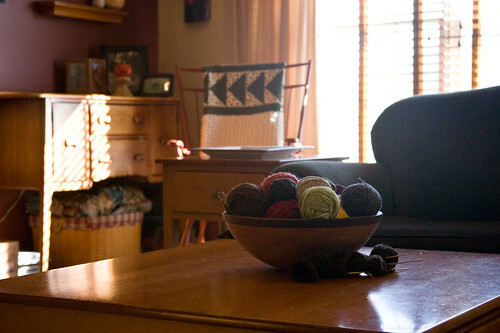 And what better way to feed the wool-obsessed brain than with a bowl of it on the coffee table. Some people pay for those little orbs made of raffia and sticks to display in a bowl. Me, I just go diving in my stash. It must be working because I have been getting some knitting done. That little bit you can see there next to the bowl is an almost complete first sock for a friend. Not shown is a the first completed mitt of a pair for someone else. Don’t worry ladies, I’m rotating these two projects so I show no favoritism. Hopefully those two will have warm feet and hands, respectively, by election day. This hat is also 1 of 2 as a thank you for another friend who generously sent me a big box of goodies. 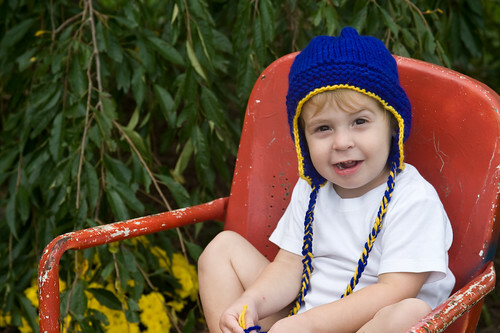 Denise and her crew are devoted fans of LSSU hockey so the hat is in that team’s colors. Seen here, modeled by Tristan, I want to see how it fits her boys to see if I need to make the next one bigger or smaller. The pattern is thorpe and the yarn is malabrigo. The next one might be yellow with blue on the edges, what do we think about that? 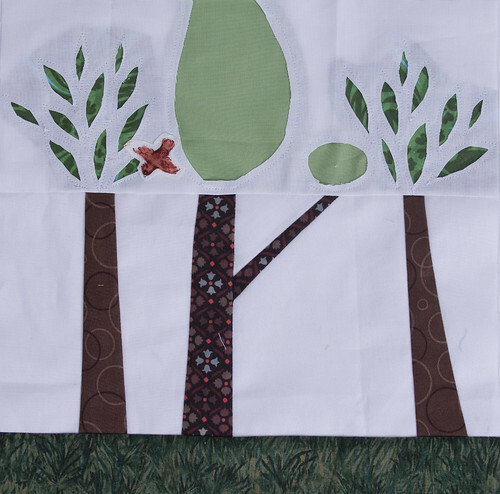 Did I ever show you my block for the July edition of the Virtual Quilting Bee? 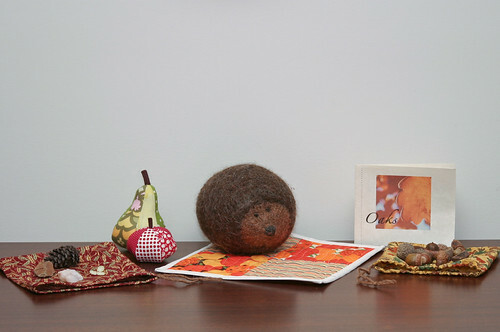 Erin’s wonderful idea was to send each of us a different print from Denyse Schmidt‘s Flea Market Fancy line. 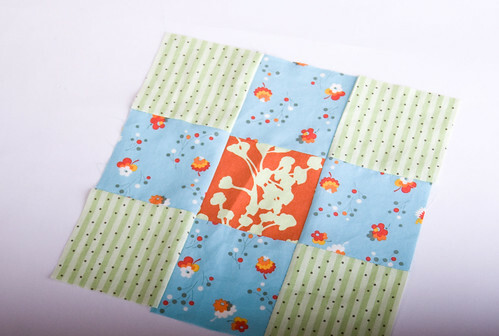 We each made a nine-patch block with the fabric she sent as the center square on each side of the block. It reminded me how much I’ve loved seeing this line all over the blogosphere and that I had a good amount of the grey floral in my stash. Then I was at my local fabric shop last weekend trying to find buttons for my long completed Juliet sweater — anyone know a source for two large natural-looking brown buttons? — and there was a bunch of the line staring me in the face. I mean, how could I resist, especially considering it was 25% off and in the colorways that coordinate with my stashed grey. As you can tell, resisting is not my forté. Now I just need to figure out what kind of quilt to make. 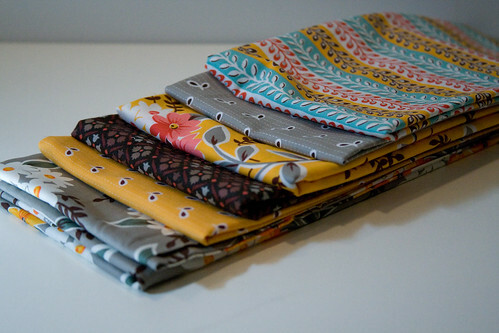 I have 1/2 yard of each fabric except the grey floral which I have lots of. My favorite quilt show of the year is on Sunday so I may find some more bits to add to the stash, but then again I may not — this line has been out for some time. I’m thinking some sort of simple block that I can cut up and rearrange to look fancy — like the disappearing nine-patch. Any suggestions? When we got our partner for the mini book swap I knew just what book we should send. The problem was we only had one copy from Papa’s childhood and there was no way we were sending that one. Funny, I didn’t think of that when I signed up for the swap. 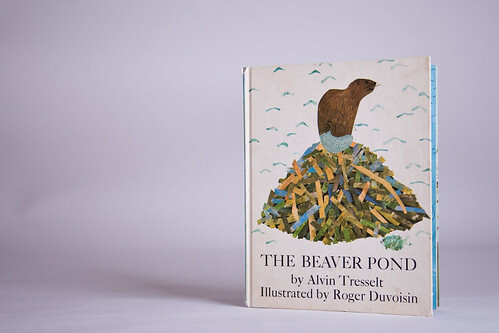 So our swapping was slightly delayed while we acquired another copy of the book, The Beaver Pond — weekly reader edition from the 70s — by Alvin Tresselt. This, to me, is a perfect children’s book. It’s a story about the natural world — one of the most fascinating topics for my urchins — and the story is brought to life with beautiful illustrations, by Roger Duvoisin. Tresselt’s prose has just enough poetry, if you know what I mean, to keep the story magical. Tresselt and Duvoisin must have made a good team since they published a number of books together, including the 1948 Caldecott medal winner — I need to get my hands on a copy of that one. We also have a copy of Tresselt’s telling of the The Mitten, also a weekly reader edition — which may be an easier title to find a copy of — and also a great story. 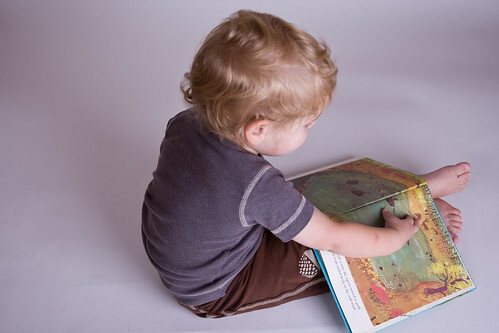 And speaking of the weekly reader children’s book club, I wonder if you can find a list of all the books sent over the years? My feeble web searching skills haven’t turned up much. 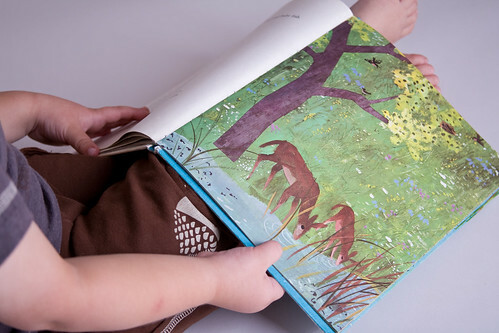 In return for The Beaver Pond we received another delightful book, The Purple Coat by Amy Hest. We’ve only read it twice so far but it is at the top of the bedtime story pile. So, what did you guys send/receive as part of the mini book swap?